Question: What is a cupcake cosy? Answer: It is a piece of fabric that dresses up your cupcake. I found circular pieces of fabric at the shops which are used to wrap up bonbonniere and it gave me the idea why not wrap up my cupcakes? 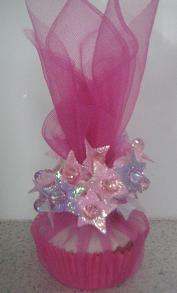 I have since bought pieces of tulle, voille, netting and numerous other light-weight fabrics to dress my cupcakes. 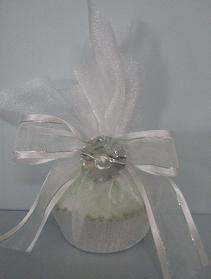 Fabric wrapped cupcakes are easy to do and much cheaper than buying clear plastic boxes. I have used the pre-hemmed fabric for bonbonniere but they don't leave much fabric to tie up. Also, there is also not a huge range of colours to choose from. I prefer to buy fabric to suit the theme of the party or birthday. When wrapped in cupcake cosies, cupcakes don't even need to be frosted, however, if I am frosting I prefer to use fondant or glace frosting. Pre-hemmed bonbonniere circles are approximately 24cm or 9.5 inches. I use ribbon to gather up the fabric and tie a bow. Another alternative is to use a diaper pin to hold the cupcake cosy together. This is especially suitable for a baby shower. 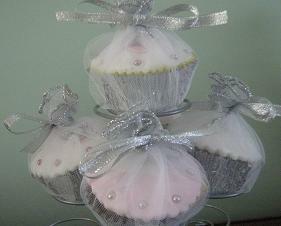 Wedding or engagement cupcakes look spectacular when stacked on a tower and wrapped in "cupcake cosies". Individually wrapped cupcakes are a great gift for guests at a wedding or anniversary to take home with them. Fruit cupcakes frosted in fondant are ideal for this. I have often used white fabric and white ribbon and attached a brightly colored button to the middle of the bow. A diamante really dresses up the display. Cupcake cosies are also suitable for Valentine's Day. Wrap cupcakes in red fabric and team with ribbon with hearts or "I Love You" printed on it. Alternatively, have patterned fabric and plain ribbon. There are so many different looks that can be achieved. Have fun wrapping your cupcakes. You will love the results.